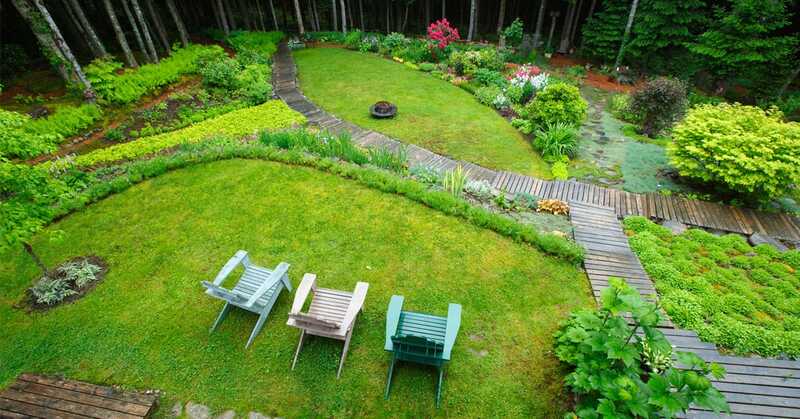 As the dominant feature of most landscape designs, a lawn requires particular attention. Practice good maintenance by following these eco-friendly guidelines and you will be rewarded with a beautiful lawn that can resist environmental stresses like drought, without resorting to chemical fertilizers and pesticides. 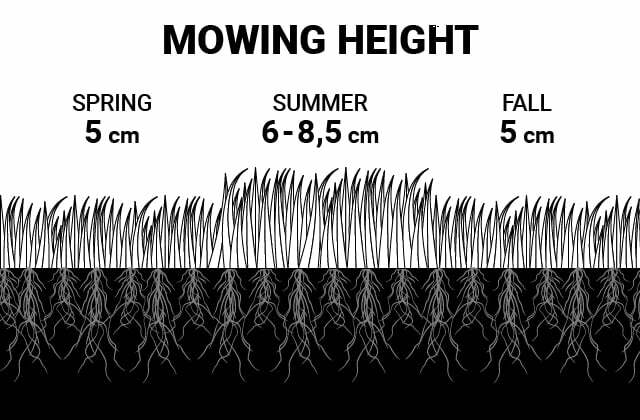 If you follow these mowing height guidelines, your lawn will be more resistant to drought, heat and weeds. 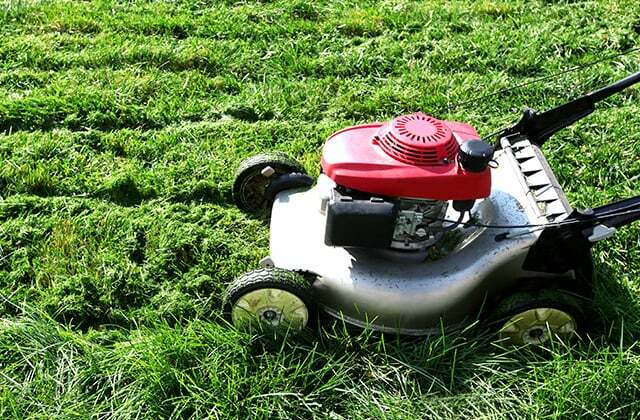 Mow regularly, provided no more than one third of the grass blade is removed in a single mowing. Adjust mowing height in accordance with seasonal guidelines. 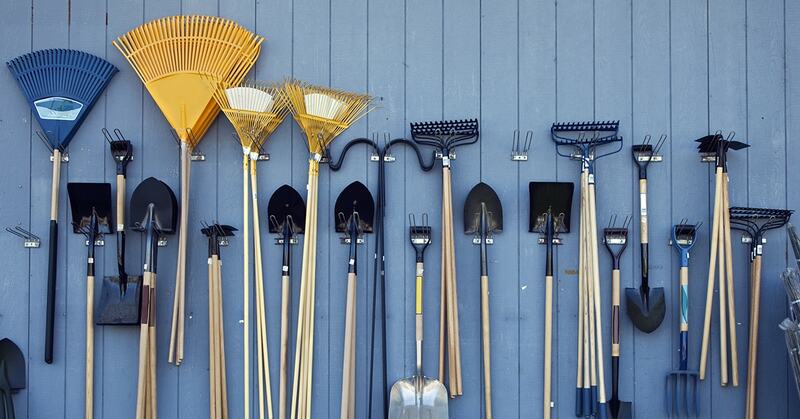 Spring: For your first mow of the year, adjust the height of the blades to 5 cm, to clean up your lawn after winter. Summer: Maintain mowing height at 8 cm; longer grass will be more drought-resistant and therefore require less watering. Do not mow during periods of high heat and drought. Fall: Your last mow should be at 5 cm, which will reduce the risk of disease. Sharpen lawn mower blades regularly, as a clean cut promotes recovery and reduces the risk of diseases. Avoid mowing when grass is damp or too wet. Avoid mowing when the soil is too moist; you risk compacting the soil. Grass clippings are a significant source of nutrients for microorganisms in the soil that are beneficial to your lawn. Practice “grasscycling”: leave grass clippings on the lawn. If you follow mowing height guidelines, grass clippings will decay quickly and won’t affect the appearance of your lawn. Rake up grass clippings that are too long or heavy to leave on the lawn; put them in the compost or spread them evenly over the lawn. Think of grass clippings as 100% natural fertilizer for your lawn. You’ll be able to cut down your fertilizer use by up to 25%. To accelerate the decomposition of clippings by microorganisms in the soil, opt for a mulching mower which grinds clippings on site. 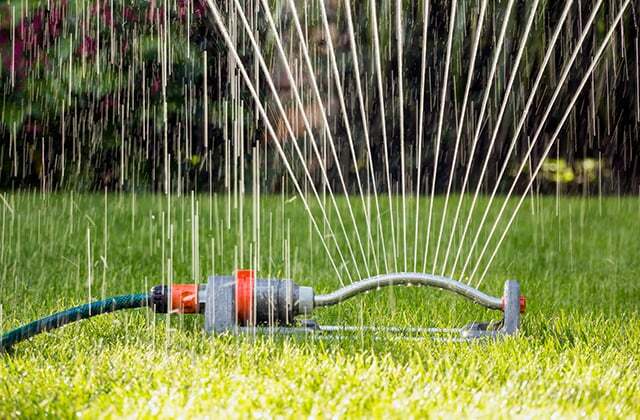 Water your lawn according to these good practices to preserve drinking water, a resource that many people wrongly believe to be unlimited. 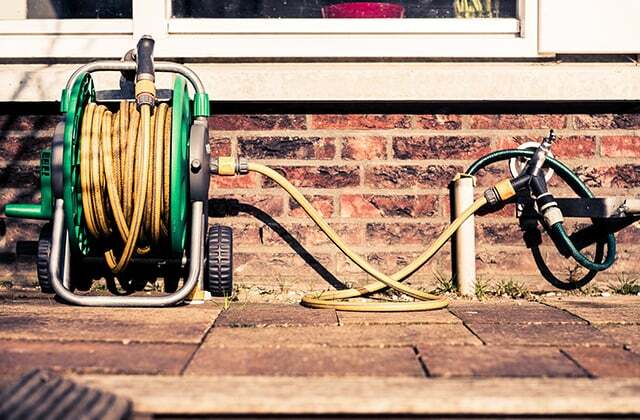 Ask your municipality about its regulations on lawn watering during the summer. Encourage the growth of deeper grass roots by adopting the ideal mowing practices mentioned above. This will help the soil retain moisture and increase the lawn’s resistance to drought. Water early in the morning or in the evening when temperatures are cooler and there is less wind; you will lose less water to evaporation. Let water penetrate 10 to 15 cm. Check after one or two hours. Avoid light and frequent watering; this simply encourages surface roots to develop making your lawn more vulnerable to drought. Use an electronic timer to avoid water loss and to turn your sprinklers on and off automatically. During periods of hot weather in the summer and when the soil is dry, the lawn will stop growing and turn a yellowish colour. Don’t panic, your lawn is not dying; it will soon green up again when it rains. 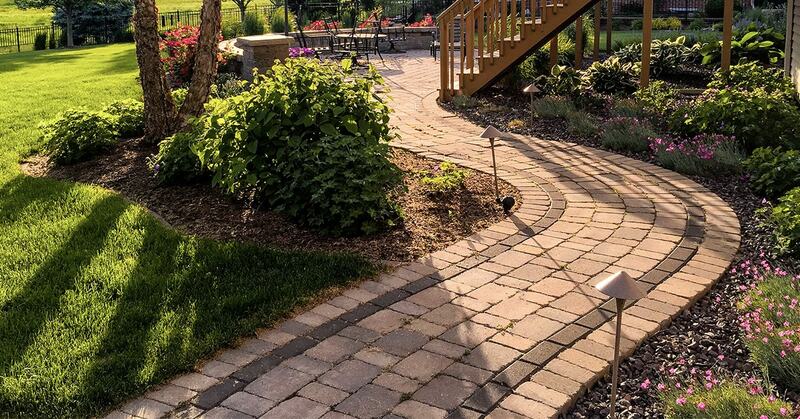 A spike sprinkler is ideal for even irrigation and wider coverage. An all-weather hose for weekend gardening. An ultra-flexible hose for the avid gardener. A hose reel will prolong the life of your hose by keeping it rolled up and out of the way when not in use. You can choose between a cart or wall-mount version. To install a wall-mount hose reel, use a carbon drill bit to drill the fastening-screw holes into the foundation. Use a 5/32'' drill bit for 3/16'' Tapcon screws, or a 3/16'' drill bit for ¼'' Tapcon screws. Make sure the hole you drill is the same length as the screws you’re using. 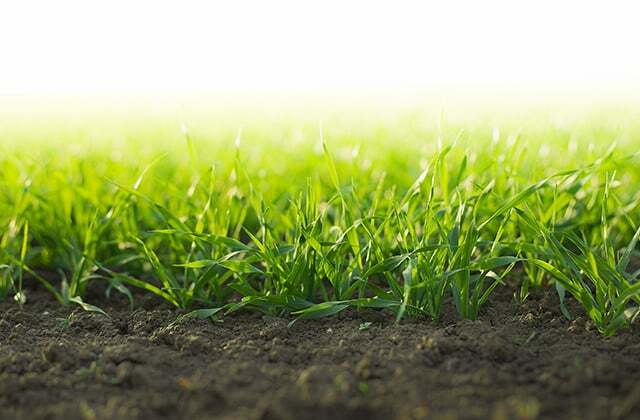 Turf grasses, like any other plant, require certain minerals for healthy growth. A strong and vigorous lawn is less vulnerable to weeds. It’s important to be familiar with certain cultivation practices before you select a fertilizing programme. Remember that topdressing and grasscycling can provide your lawn with approximately 25% of the nitrogen it requires, a cost-saving practice that reduces the amount of fertilizer you will need to apply. 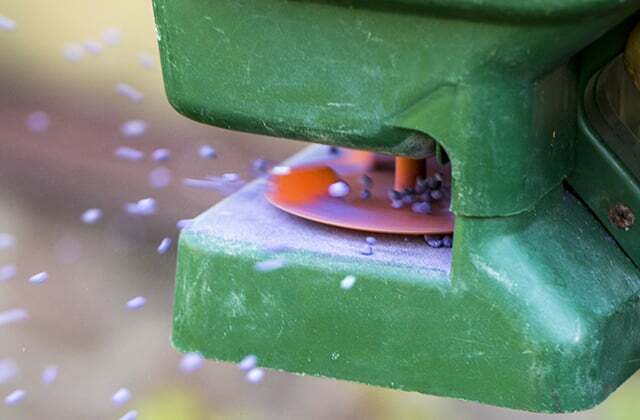 Topdressing involves aerating the soil as needed before applying quality lawn soil or compost on the ground, and then spreading a layer of seeds over it. A corn gluten-based fertilizer has also been available for the past few years; in addition to providing nitrogen (the first number on the fertilizer list), it reduces the number of weeds such as dandelions and broad-leaved plantain on the lawn. Corn gluten works by preventing roots from forming as the seeds of weeds are germinating. Do not use corn gluten-based fertilizer if you have recently overseeded your lawn because it can hinder the growth of your grass seed. Most natural fertilizers release their nutrients throughout the season by means of beneficial soil organisms. In addition to feeding the lawn, these fertilizers stimulate biological life in the soil and present zero risk of burns. In the spring, use a fertilizer with a first number that is higher than the other two, like 12-0-4 or 9-3-4. In late-summer and fall, you should use a fertilizer with a higher potassium content (i.e. 4-0-12), to prepare the lawn for the rigours of winter. Read the manufacturer’s instructions carefully and adhere to recommended quantities. Using a natural granular fertilizer generally requires one or two applications per year. The first application should be done in the spring when grass is starting to grow and growth is at its peak. If necessary and indicated on the manufacturer’s label, the second application should be done late summer to early fall. 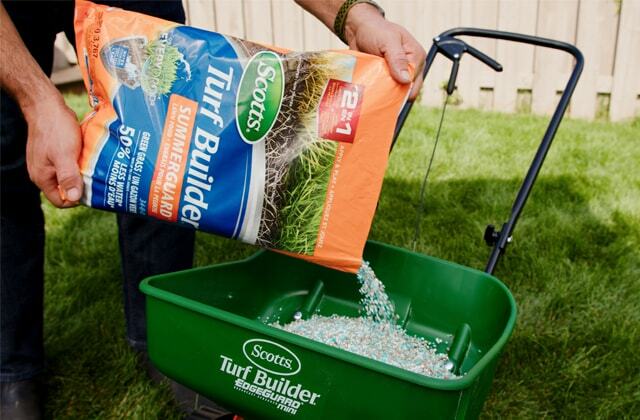 Apply granular fertilizers with a fertilizer spreader on dry and freshly-mown lawn. The spreader is easy to use and allows for an even distribution over the entire lawn surface. It can also be used for liming or for seeding. Choose a model equipped with a safety stop to avoid spillage and a flow control regulator to adjust quantities. The size of the tray varies from one model to another. Make sure it’s suitable for the type of fertilizer you plan to use and for the size of your yard. Always follow the instructions on the label and apply the correct quantities. To ensure equal distribution, spread half the recommended dose in one direction and the other half in the other direction. Before using soil conditioners, pesticides or fertilizers, read the instructions on the product label very carefully. Pay special attention to warnings and follow the necessary precautions before, during and after using the product. Storage requirements are also important.